Situated on the corner of West 10th Street and the ever-confusing West 4th Street (why, exactly, does it run diagonal across other numbered streets? ), Empellón Taqueria is a kind of Mexican cuisine oasis. Once you step inside, you’re transported to another place—one where graffiti on the wall behind the bar is the norm and the list of margaritas stretches on and on. Don’t be fooled—Empellón Taqueria is a true taqueria, meaning that they primarily serve (and specialize in) tacos. You won’t find your overstuffed burrito or simpleton’s quesadilla here. Go somewhere else, like Chipotle, if this is what you seek. My Lady Dining Partner (MLDP) and I began our meal with a box of tortilla chips and one of the salsas (tomatillo-chipotle). The salsa can only be described as smokey, and its consistent composition delighted and surprised me. Many salsas have chunks of vegetables mixed throughout, whereas Empellón Taqueria’s rendition (at least the one I had) was a smooth, thick sauce. MLDP ordered the classic margarita, which was tangy, and I got a standard Negra Modelo. We moved on to the next must-have at this spot: queso fundido. For the uninitiated, queso fundido is a wonderful creation: a small, cast-iron pan is filled with melted Chihuahua cheese and served with warm tortillas. As anyone who’s ever had breakfast with me will attest, I love building little sandwiches out of anything in front of me. So, the prospect of lathering up a tortilla with a bit of cheese excited me. The queso fundido we chose had green (?) chorizo with spinach. Unlike other versions I’ve had in the past, this QF was rather meaty. Chunks of delicious chorizo covered the surface of the cheese. Spinach did make an appearance, though it was more of a cameo rather than a starring role. 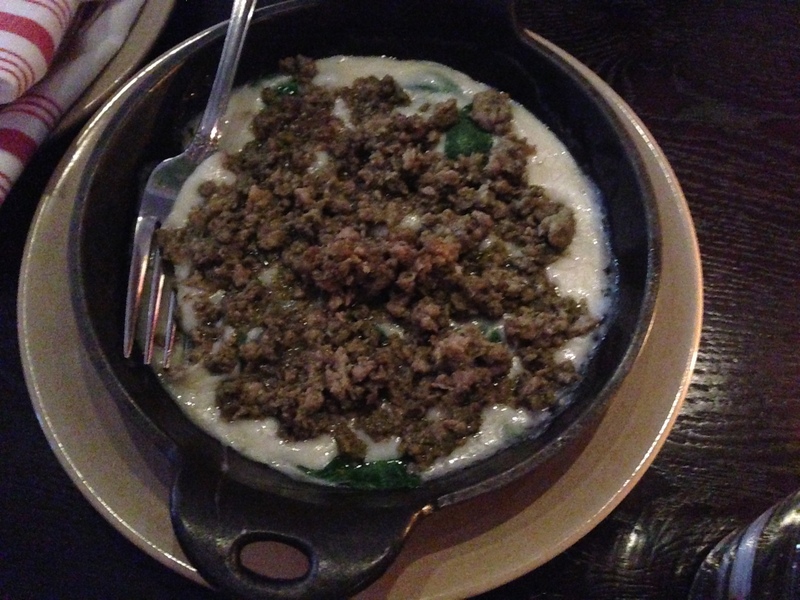 I loved it, and I highly recommend you try this dish. For our entrees, we both ordered tacos (not that we had much of a choice!). The list of tacos is creative, to say the least, and I opted for possibly the most boring one: chicken. But! 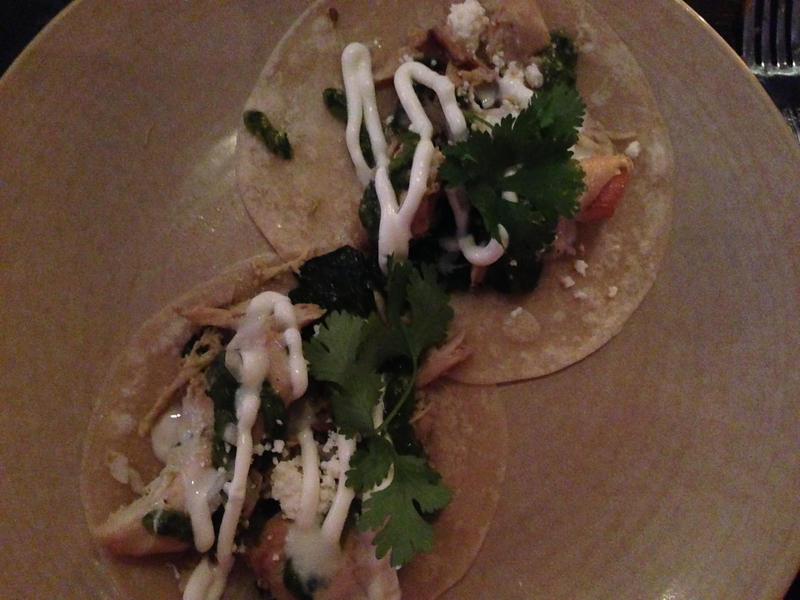 The tender chicken pieces came with black kale, crema and salsa verde, for a satisfying combination of flavors. I ordered two, but you’re welcome to order three, if you’re hungry. Pro tip: get the chips and QF like I did, and just order two tacos. MLDP tried the fish tacos, which were doused in tempura and looked quite good. The helpful waitress came over to us once we were finished with our entrees and asked us about dessert. 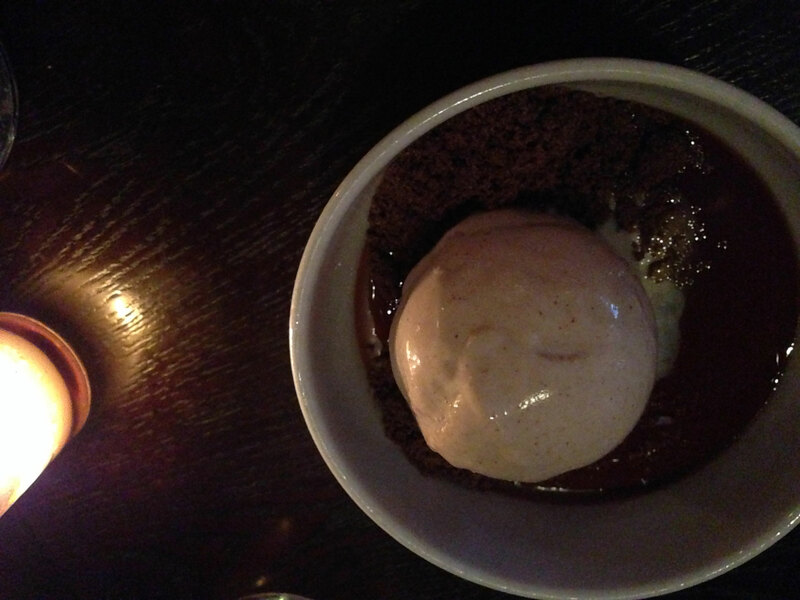 She rattled off a few options, and we landed on the milk chocolate flan, which came with densely cinnamon-flavored ice cream and crumbled (Oreo?) cookies. ‘Twas delish, but don’t count on having that when you go. It sounded like the desserts rotate. Empellón Taqueria is definitely at the top of my list of New York City taco shops. I’ve been told that Salvation Taco is a must-try and I’ll definitely report back with an assessment once I go. For now, I urge you to go to Empellón Taqueria. You’ll need a reservation, most likely—even on a weeknight! So head to OpenTable now and get to this restaurant as soon as you can. Take the 1 to Christopher Street, walk north one block and turn left onto West 4th Street.